On Monday, I attended an inspiring training day at the University of Southern Queensland, run by the Office for the Advancement of Learning and Teaching. I came away with a head full of ideas on how to improve my courses and to teach generally. One small idea I look forward to trialling is setting up a formative quiz at the beginning of the semester to gauge students’ starting level of knowledge. This also has the ancillary benefit of encouraging students to engage with Moodle early in the topic. I’ll report on the results! A colleague and I were asked to share our task management/planning strategies with the group. 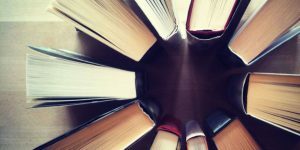 I’ve been using SkedPal for the last six months or so, and I think it offers some unique and powerful features that are particularly useful for academics, which I shared with the group. SkedPal combines task management/to-do lists with your calendar. Once you link your Outlook or Google calendar, your tasks are scheduled around your calendar appointments. This is great for people who do not want to rely on their willpower or spend time throughout their day deciding what to do next — its already been cleverly scheduled for you! You estimate how long a task will take and SkedPal finds a gap in your calendar. But where SkedPal sets itself apart from other time management/to-do apps is through its use of ‘time maps’. 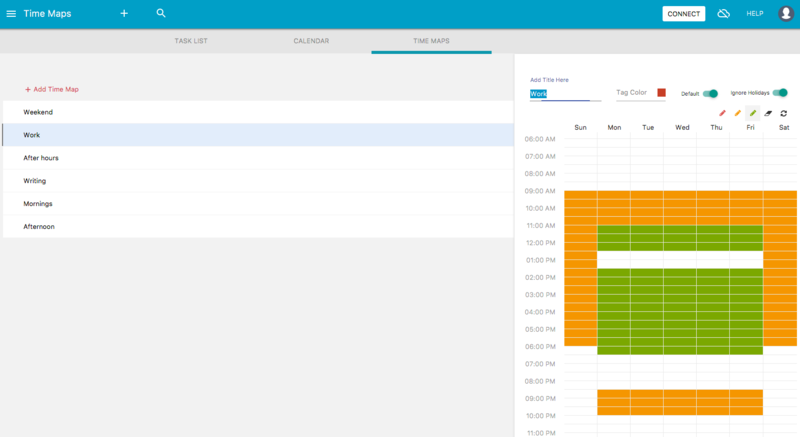 Time maps allow the user to designate blocks of time to certain tasks throughout their week. Every task is allocated to one or more time maps. For example, one of my time maps is called ‘writing’, and this covers Monday through to Friday, from 9-11am. Any tasks assigned to this ’time map’ will be scheduled for that period. Here is a look at my ‘writing’ time map. You can also specify times when it would be less desirable to work on this set of tasks, but you are willing to do it. I find this particularly useful for when I have multiple deadlines (marking, teaching, publishing) and my work hours are extended. Below is my default ‘work’ time map. This shows that most tasks will be scheduled from 11-6:30 pm, with a break for lunch. The orange time blocks are where tasks can be scheduled if they need to be. I also have an early morning time map if I need it. I am in the final stages of completing my PhD, so anything related to my thesis is assigned to my writing time map. This means every day I know I have at least 2 hours I spend on my thesis. If there is not enough room for a particular task to be scheduled on a given day, then it will be scheduled to another day where there is a gap in my calendar. You can ensure a task is completed today by setting the due date as today. Giving it a ‘high priority’ flag will also promote this task over non-flagged tasks. You might be concerned that having a calendar full all the time will make it hard for colleagues to schedule appointments. But there is a setting that allows all SkedPal tasks to appear as either ‘busy’ or ‘available’. You can automatically schedule a time buffer between tasks. Either as a fixed figure or as a percentage of the duration of the task, which is great in case something takes you longer than expected. If things go off the rails (e.g. unexpected meeting), you can always click reschedule and SkedPal will replan your day, based on your priorities, due dates and time maps. You can always click and drag tasks to manual reschedule them and they remain ‘pinned’ to that time even when you click reschedule. It is possible to partially complete large tasks, which may get split-up throughout your day (although you can specify the minimum block length, i.e. you don’t want to spend less than 1 hour or 30 minutes on a larger task). When you partially complete a task, when you reschedule your day the 1-hour’s work you completed on a 3-hour task is not ignored. If you are struggling to find more time to write, I encourage you to consider SkedPal. They are currently offering a 14-day free trial, so you can try it risk-free and see if it works for you. It is available on Mac, Windows, Linux, iOS and Google Play. SkedPal is cloud-based, so all your apps sync in real time as well! If you have any questions about how I use SkedPal, post them below. Likewise, I would like to hear what works for you. Do you use a lot of time maps or only a few? I have been a sessional academic since 2014. During this time I’ve been completing my Doctoral thesis and being actively involved in several animal protection groups in various capacities. I am also fairly lazy (just ask my partner, Aimee). So doing things as efficiently as possible has been a long-standing interest of mine, even before returning to university. One of my goals in starting this blog is to share with you some of the more useful apps that you may like to integrate into your teaching/researching so you can spend more time researching, writing and otherwise having a life outside of academia. I don’t claim to be some productivity guru. I am not. I have lost days being painfully unproductive. What I do know, is that I am generally more productive than ever before and this is due, in part, to the software I use. We live in the golden age of apps. App development for Mac and iOS has become a lot simpler since the introduction of Swift, Apple Inc’s open source programming software, in 2014. Since then, it seems like everyone has turned their hand to app development. I have even been tempted to develop a few app ideas I have, but that is for another post. As a starting point, I should outline the apps that I currently use. In subsequent posts, I will explain why I have chosen one app over the other and how it can benefit those working in academia. I hope to hear from some of you regarding other apps I may have overlooked. In BETA but still my task management app of choice. More on this later. For emails. Excellent new integration with Evernote. As a repository for everything. I have snippets for emails and marking work. For custom keyboard shortcuts for common and repetitive tasks such as inserting a footnote into Scrivener. For web-based articles I come across but don’t have time (or the inclination) to read now. My word processor of choice for long-form documents, especially when using the Australian Legal Guide to Citation in footnotes. So much much stable than MS Word. Citation software for the Australian Guide to Legal Citation and digital repository for all academic sources. For accessing and annotating my digital academic library on the go. For digitising hard-copy book chapters/ articles. For tracking the time taken on specific tasks. Especially valuable when I need to submit timesheets for marking or research assistant work.